Preheat oven to 425 degrees, with rack in upper third. Line a rimmed baking sheet with aluminum foil; set aside. In a food processor, place bread, Parmesan, oil, and a pinch each salt and pepper. Pulse until coarse crumbs form; transfer to a shallow bowl. Place flour in a second shallow bowl; season with salt and pepper. Place egg white in a third shallow bowl, and beat with a fork until frothy. Dip top side of a chicken breast in flour, shaking off excess. Dip same side in egg white, letting excess drip off, then in breadcrumbs, pressing to adhere. (Do not bread other side.) Repeat with remaining chicken and transfer, breaded side up, to prepared baking sheet. Bake until breadcrumbs are crisp and browned, 8 to 10 minutes. Remove from oven; sprinkle with mozzarella. Continue baking until chicken is opaque throughout and cheese is lightly browned, 2 to 4 minutes. Meanwhile, in a large skillet, place tomatoes, breaking them up with your fingers. Add garlic; season with salt and pepper. Bring to a boil, reduce to a simmer, and cook until sauce has thickened, 6 to 8 minutes. 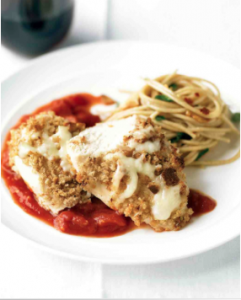 Serve chicken with a generous amount of tomato sauce.